The first of three blogs – written by one of our volunteers, Rod Cooper – that takes a look at the history of a remarkable and long lasting fundraising initiative for The Children’s Society and it’s former Children’s Union that Sir Neville Wilkinson started in 1907 – Titania’s Palace. The son of a barrister, Neville Rodwell Wilkinson was born in October 1869, at Highgate, Middlesex. Clearly, at such time, there could have been no possible inkling of Sir Neville’s subsequent career as a serving officer in the Second Boer War, of his marriage to the first daughter of the 14th Earl of Pembroke, Lady Beatrix Herbert in 1903, or of his appointment to the Ulster King of Arms in 1908, his subsequent knighthood in 1920, or of his long career as philanthropist, genealogist, artist, author, traveller and aesthete. Both Sir Neville and his wife, Lady Beatrix, rose to senior positions in children’s charities; Sir Neville becoming Chairman of the League of Pity (a precursor organisation of the NSPCC), and Lady Beatrix serving as President of the Children’s Union run by the Waifs and Strays Society (as The Children’s Society was formerly known). 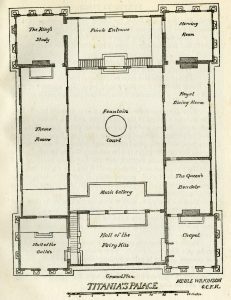 Sir Neville’s activity in this sphere was further marked by a quite singular and unusual pursuit; the design and development, and subsequent promotion and display of doll’s houses created for the benefit of the charities to which he and his wife represented. These doll’s houses were never conceived as toys or playthings; they were works of art in themselves, displaying high levels of design and craftsmanship, and deliberately produced for display purposes. Sir Neville’s first venture in this connection was the creation of Pembroke Palace. 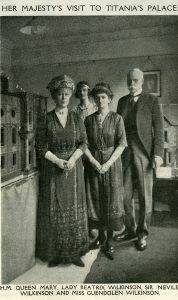 Opened for exhibition by Queen Alexandra at Wilton House (the country seat of the Earls of Pembroke) in 1908, Pembroke Palace was a large doll’s house comprising three floor levels extending over a base of almost two square metres. 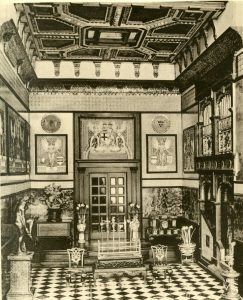 Populated with finely crafted miniature fittings and furnishings, the house also included original works of art produced by Sir Neville, including portraits of his father-in-law, the 14th Earl of Pembroke, Sir Neville’s oldest daughter, Guendolen (born 1904) and his own self-portrait. All as miniatures, of course. Emboldened by the success of Pembroke Palace, and with the intention of producing a much grander and – more importantly – portable attraction, Sir Neville embarked on a yet more ambitious venture before the paint was barely dry on his first. The inspiration for this occurred when Sir Neville was undertaking a pencil study of a sycamore tree close to the Wilkinson’s Mount Merrion home in Dublin. His three-year old daughter, Guendolen, fancying she‘d seen a fairy disappear beneath the base of the tree gave rise to Sir Neville’s vision of an entire palace – fit for Titania, the Fairy Queen – laying beneath the base of the tree. First conceived in 1907, Titania’s Palace – though still not entirely complete – was formally ‘opened’ by Queen Mary in July 1922, shortly before it was put on public display for the first time at the Daily Express Woman’s Exhibition at Olympia. And whilst Sir Neville was very much its instigator, designer and ‘architect’, the construction and adornment of Titania’s Palace was the result of many minds and expert hands. Of these, pride of place goes rightly to Dublin-based cabinet maker James Hicks and his fellow craftsmen; to whom the greater part of the general construction, panelling and furnishing are associated. Among the 3,000 contents there are true gems of antiquity; there is a late sixteenth century cannon by Michael Mann of Nuremburg (it is a working model), a small (obviously small!) Samuel Palmer watercolour and a tiny enamel horse discovered in the Valley of Kings and believed to be 3,000 years old. 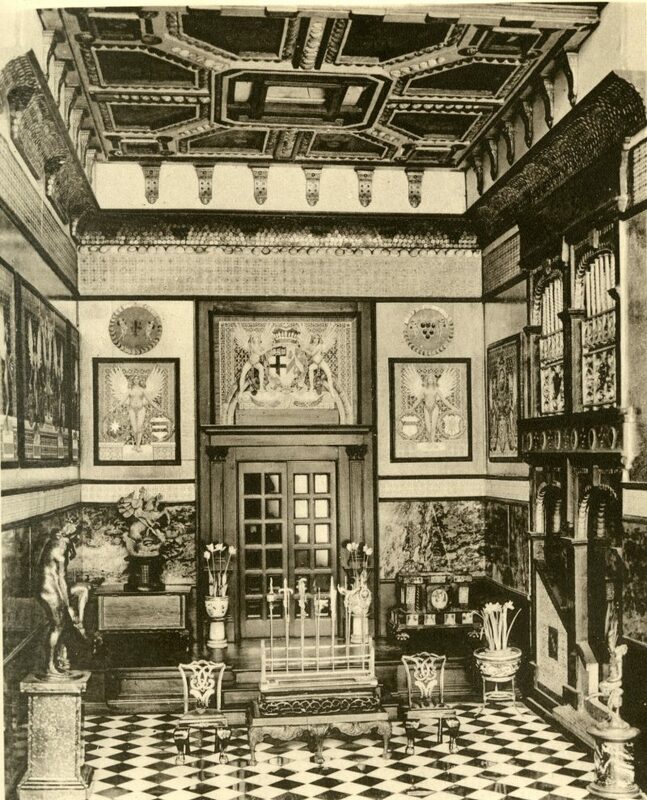 Sir Neville himself decorated many of the rooms, Sir Edwin Lutyens chipped in with the belfry (inspired by the Church of St George, Hanover Square, London) and – no less significant, and true reminder of the Palace’s purpose – Sir Neville records “dainty towels and pillow slips made by the cripple girls at St Agnes’ home” for the Palace’s Night Nursery. From the outset Sir Neville designed his doll’s house with the express purpose of being able to dismantle and transport it safely, and with the consequent aim of allowing as many – paying – visitors to view it as possible. 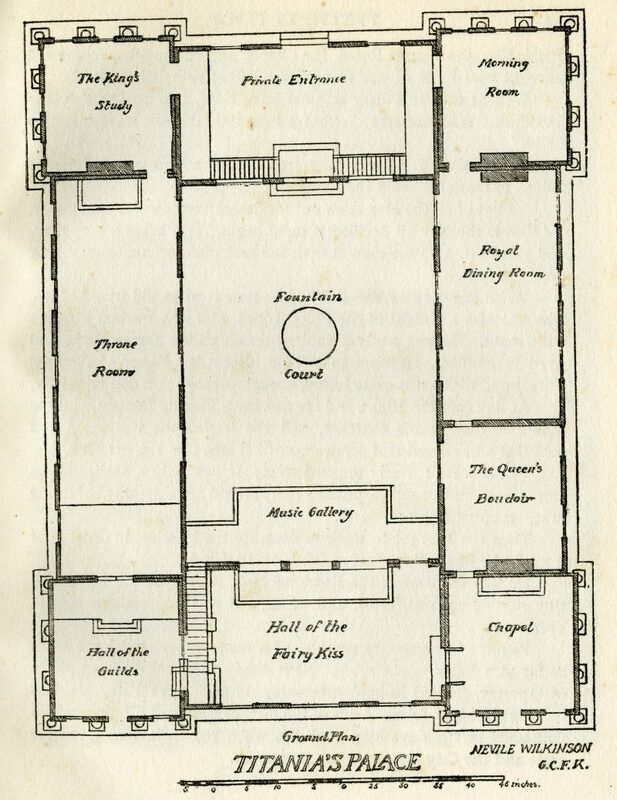 Designed on a scale of 1:12 (i.e., one inch to one foot) Titania’s Palace, comprised at least sixteen separate rooms and was almost three metres long and half a metre wide. Excluding the cupola it averaged about 75 centimetres high. With the inclusion of its integral surrounding rail – which acted both as a general guard rail and as a perch for younger visitors – the overall attraction covered an area of approximately six square metres and weighed over three tons. 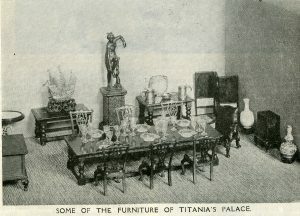 Titania’s Palace was designed to be dismantled into a number of sections, and specially made padded packing cases were included in the design in order that the entire attraction could be dismantled and re-assembled by as few as two men. For the sake of durability, strength and resistance to changes in temperature, there was careful selection of materials too, which included much use of 100-year old mahogany. Given the investment in time and money required to prepare his undeniably spectacular attraction for public display, Sir Neville revealed, a number of years later in 1930, that there were “no funds available for a publicity campaign.” But this was to prove little or no impediment. Necessity being the mother of invention, Sir Neville embarked on novel ways to promote his attraction. Indeed, he was to prove that there is nothing new in the advertising notion of the ‘tie-in’ and the promotion of mutual interest – showing as he did that the pursuit of profit could work hand in hand with charity. 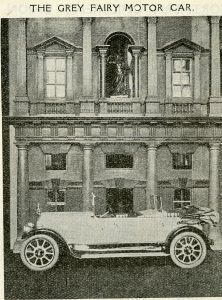 In the November 1922 issue of Brothers and Sisters – the monthly magazine of the Children’s Union – Sir Neville announced that Titania’s Palace would be on display until early in the New Year at Humber House, located at number 94 New Bond Street, in London’s Mayfair. 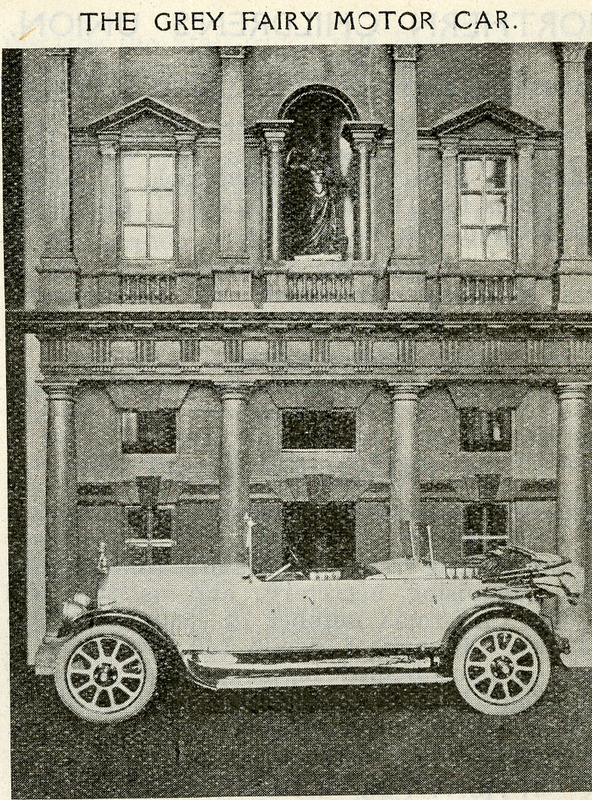 This was the premier showroom for Humber Motor Cars and it was Humber Limited that produced the ‘Grey Fairy’, the 15 HP model car that stands awaiting passengers outside Titania’s Palace. No doubt Sir Neville’s exhortation to his readers, “Please, daddy, take me up to London to see the Fairy Palace”, saw more visitors – and no doubt hoped-for-custom – to Humber’s showroom. Consequently, presenting Titania’s Palace on commercial premises would be a constant, and as the attraction moved first around the towns and cities of the United Kingdom and Ireland, and then the USA, it was frequently installed for display in a town’s most central and prestigious department store. Adding to the immediacy of the display’s impact, a portion of the revenues generated by Titania’s Palace would often be donated to a local children’s ward, hospital or home. The remaining portion being split evenly between the Children’s Union (Waifs and Strays Society) and the League of Pity. ” The Grey Fairy Motor Car”, Brothers and Sisters, December 1992, December, p.271. As a tie-in with Titania’s Palace, Sir Neville authored a series of children’s books recording the adventures of Yvette, a young girl and her various friends, and a fatherly character referred to as “the Old Painter”, who travel together to visit Titania’s Palace, wherever it may be. The first two books in the series were published as early as 1922, and were thus available before Titania’s Palace was placed on public display. The first book was “Yvette in Italy”, which was swiftly followed by “Grey Fairy” (with adventures in the aforementioned car). Three further books in the series were published in the following years; “Yvette in Venice” (1923), “Yvette in Switzerland” (1925), and “Yvette in the USA” (1929). Sir Neville also ensured that the readers of Brothers and Sisters were constantly informed of developments surrounding Titania’s Palace, informing children of the towns it visited and of the adventures of it fictitious residents. These articles, representing part of Sir Neville’s almost ceaseless promotion of Titania’s Palace and the “Yvette” series of books will form the basis of subsequent articles. These will also look at the more recent history of Titania’s Palace, which, you might be pleased to know, remains in good order and can still be visited. This entry was posted in Archive stories and tagged Children's Union, Fundraising, Titania's Palace by Ian Wakeling. Bookmark the permalink.